It’s important for big sisters to let little sisters know who rules. I’ll always remember this moment when the pecking order was made abundantly clear to a certain pesky little sister. Tallulah had just joined our family and she had the nerve to pull all of my toys out of my toy basket and act like they belonged to her. Seriously? With one bark, I let Tallulah Bee know that I was still the Queen Bee in my house . . . and I got the toy. That was a little more than two years ago. From time to time, I still have to remind Tallulah that I am the big sister and that being the big sister has its privileges. But for the most part, she understands: Big Sisters Rule! 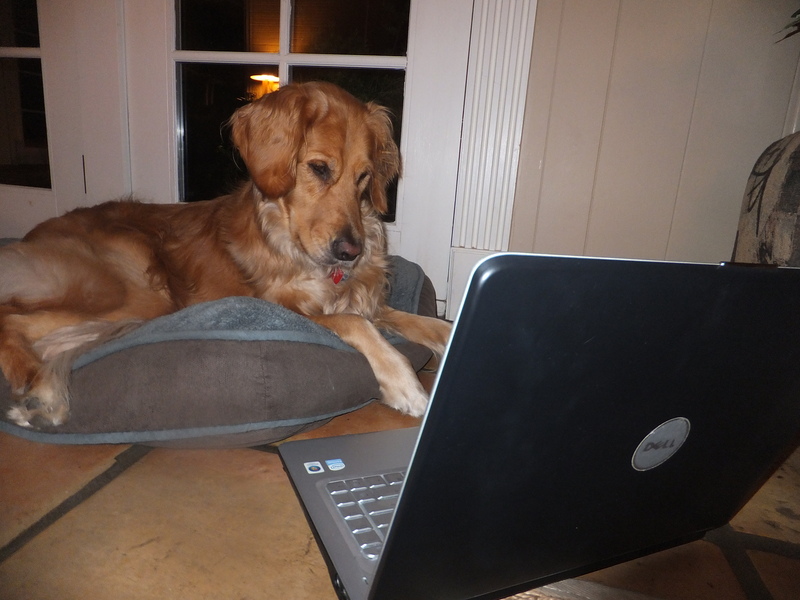 A recent post by The Daily Golden blog had a link to a Golden Retriever puppy cam. I cannot stop watching! The puppies are too cute. 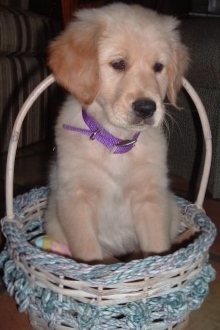 It reminds me of just a few years ago when I was a puppy. 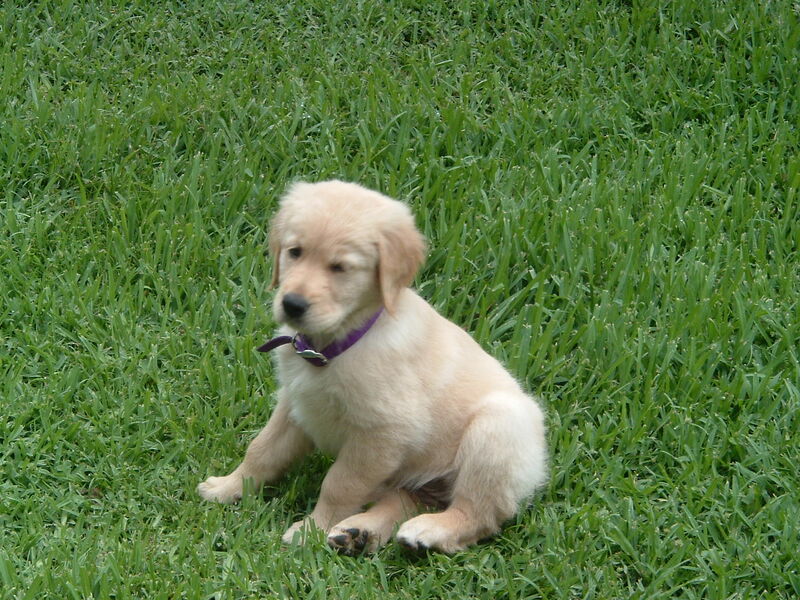 This is me at six weeks old, and this is the day my mommy fell in love with me. She actually met me one week before this. That was when my daddy fell in love with me (after I kissed his nose), but it took my mommy a little longer to come around. 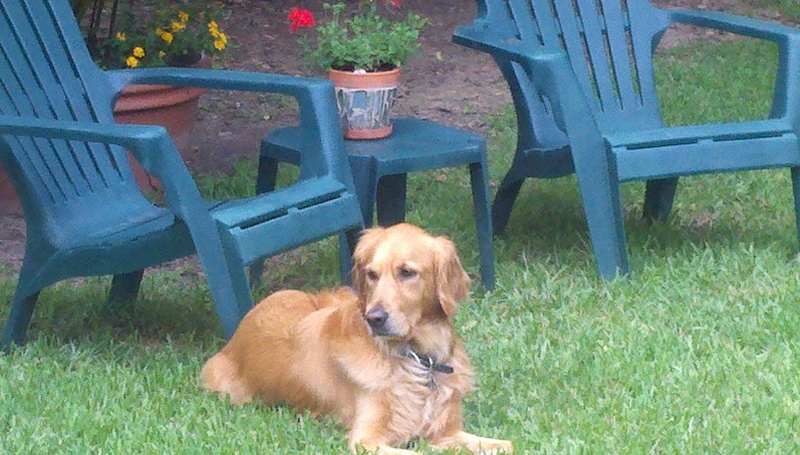 I think she still had a very, very special place in her heart for Talbot, the Golden Retriever who preceded me; but on this day, I sat up, grabbed her hand, stared into her eyes . . . and I’ve had her heart ever since. Here I am two weeks later, at home in my back yard. Everything was still a little new to me then. Little did I know what amazing adventures my parents had in store for me. Notice that they had switched my collar from pink to purple. 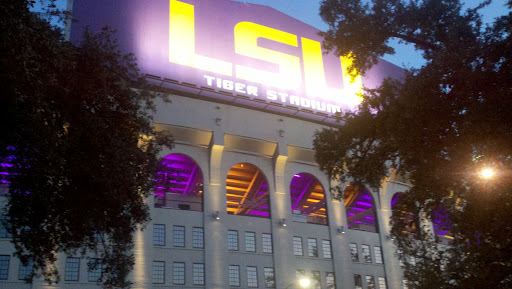 I was already becoming a fan of LSU and the Fighting Tigers. 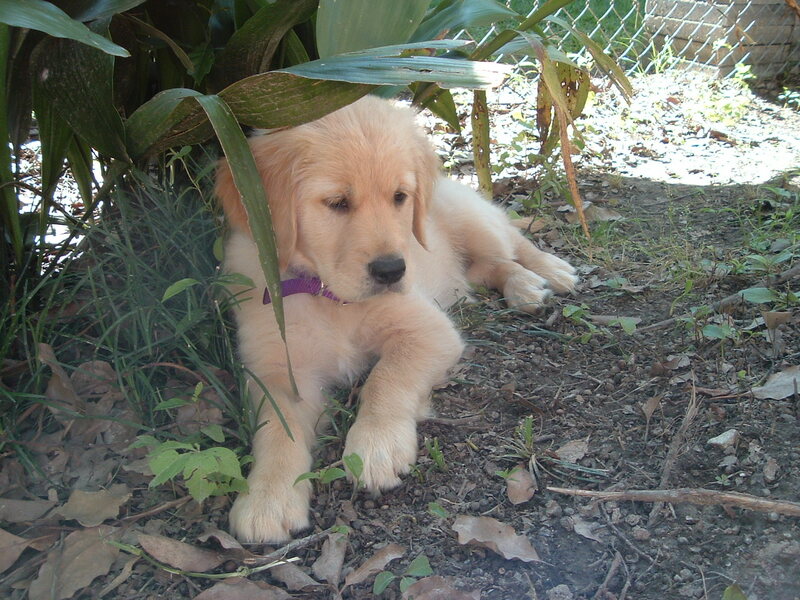 Just a few days later, I was much more comfortable and ready to explore . . .
. . . and at 10 weeks, I was fearless. 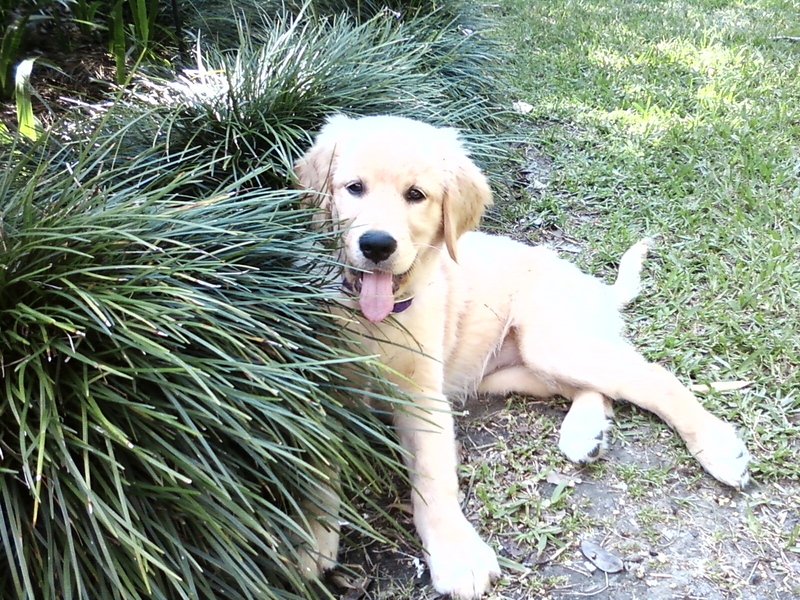 When I was 16 weeks old, I had my first trip to the LSU campus. 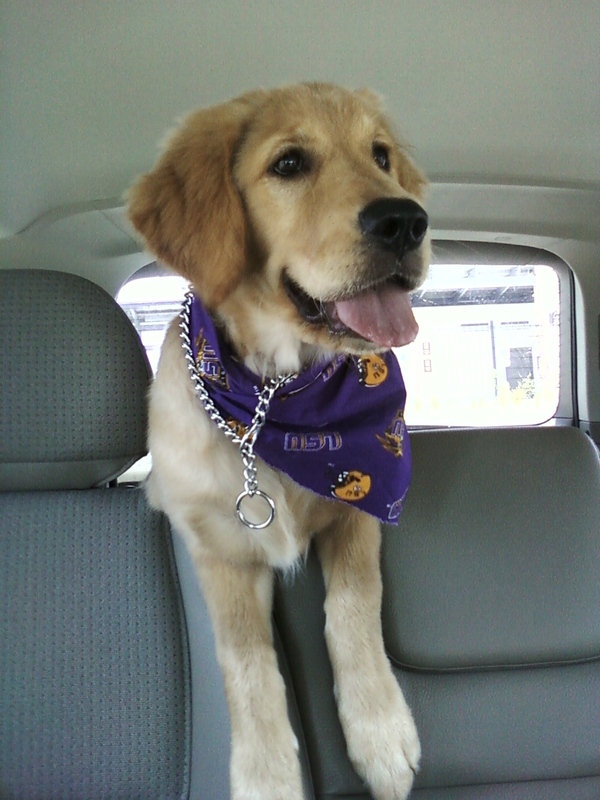 My neighbor, Rudy, let me borrow his LSU bandana. It was a great day. Isn’t it just amazing how fast puppies grow up? 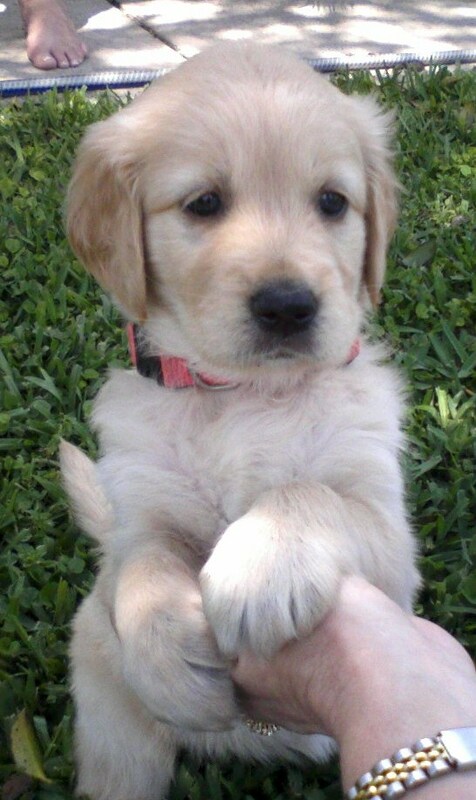 Just 10 weeks after I stole my mommy’s heart, I was almost too big for her to carry me. She says now that if she had known how fast I was going to grow, she would have carried me so much that I never would have learned to walk. I’m glad my mommy didn’t know how fast I was going to grow!
. . . just make me want to lie down on my bed–or lie down with half of my body falling off of my bed–and sleep. Yesterday was our third rainy day in a row. You can tell from the towel placed on the floor that a certain Golden Retriever had to have her muddy paws wiped before returning to the comfortable and dry confines of her home . . . and returning to sleep mode until the sun reappeared. Rainy days also make me miss my yard. 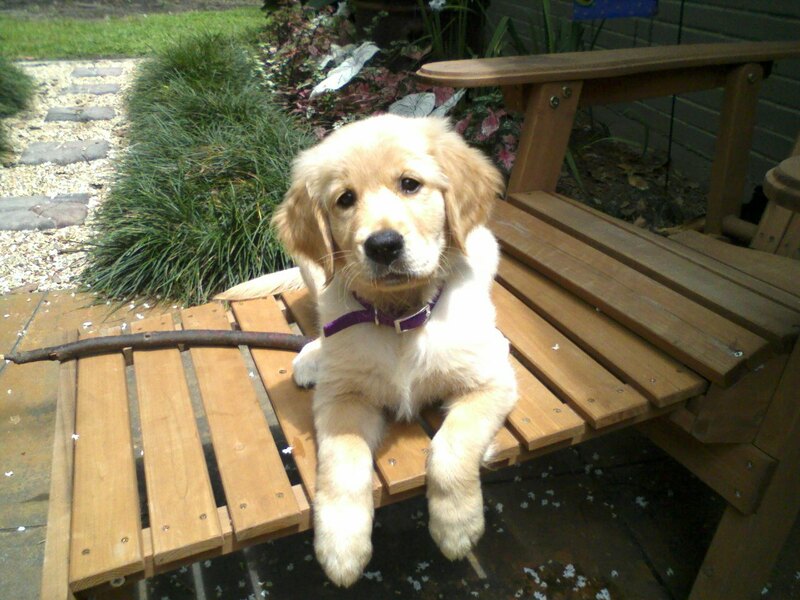 I have loved my yard since I was a puppy. When I was very small, I crawled into a lawn chair so that I could enjoy gazing upon the birds and squirrels as they frolicked in the trees . . . but then I fell asleep. I have always had a fondness for monkey grass and sticks. 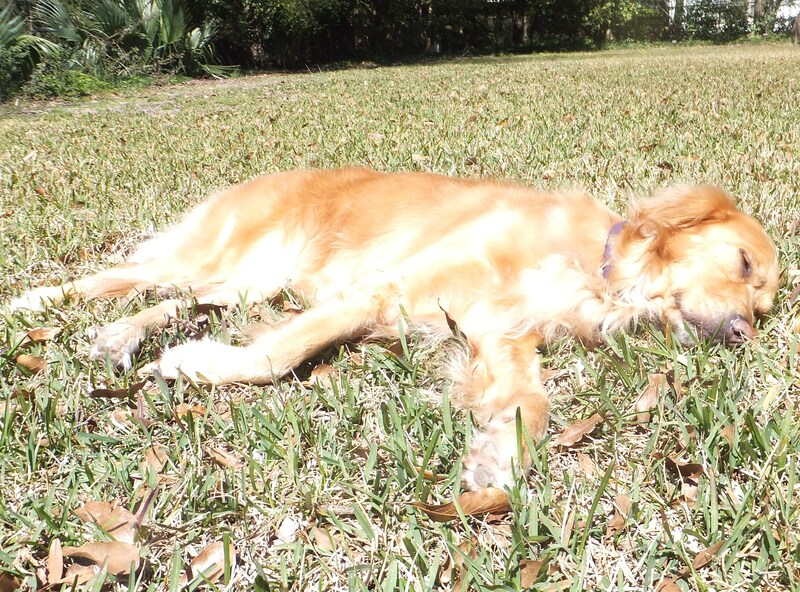 A Golden Retriever can amuse herself for hours chewing on a few stray sticks, and then she can cool down by lying in a nice clump of monkey grass. Fortunately, the rains have stopped today, the sun has come out, the grass has dried . . .
. . . and I have returned to my yard. Watch out, squirrels! 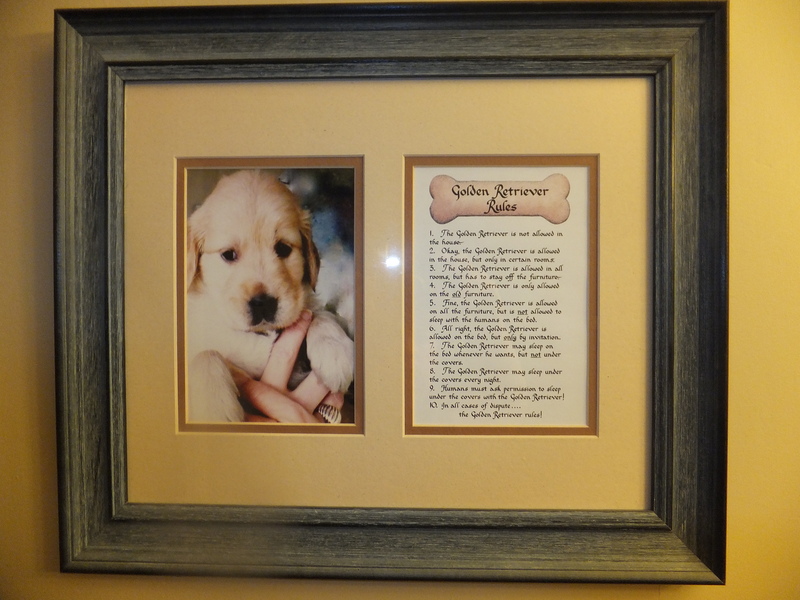 When I was just a puppy, my neighbor gave this to my parents. 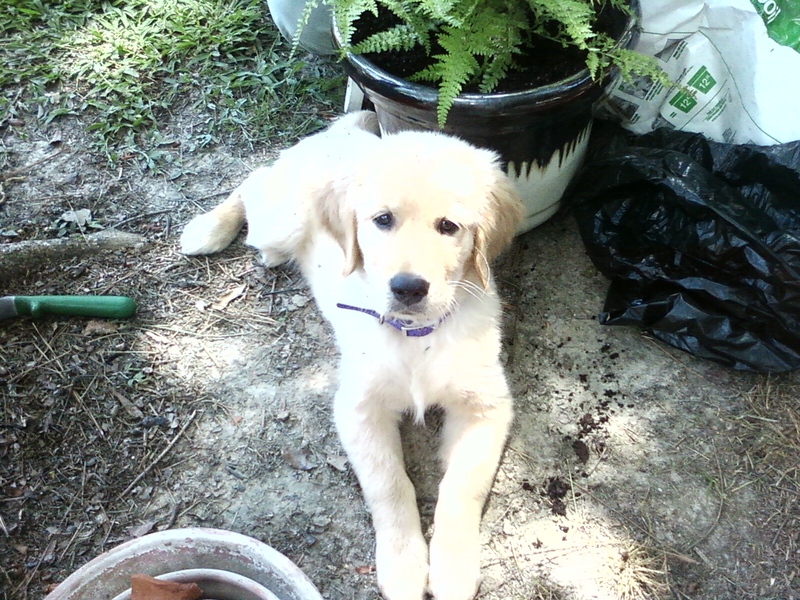 I’m so glad she managed to set my parents straight early on regarding the truth about Golden Retrievers and rules. 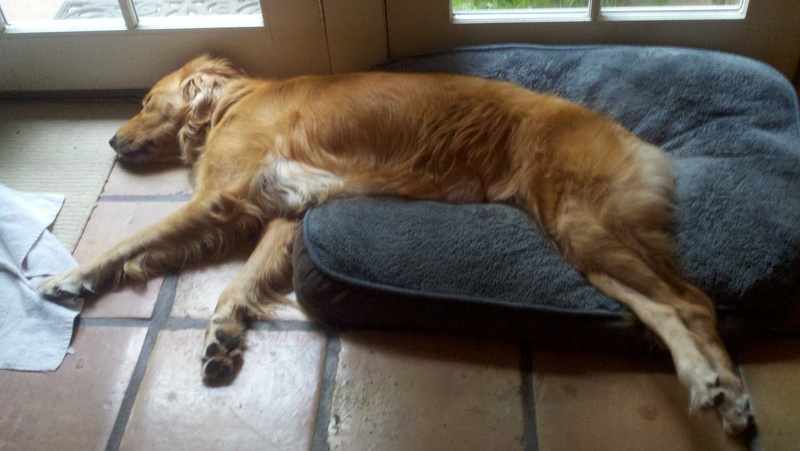 The Golden Retriever is not allowed in the house. 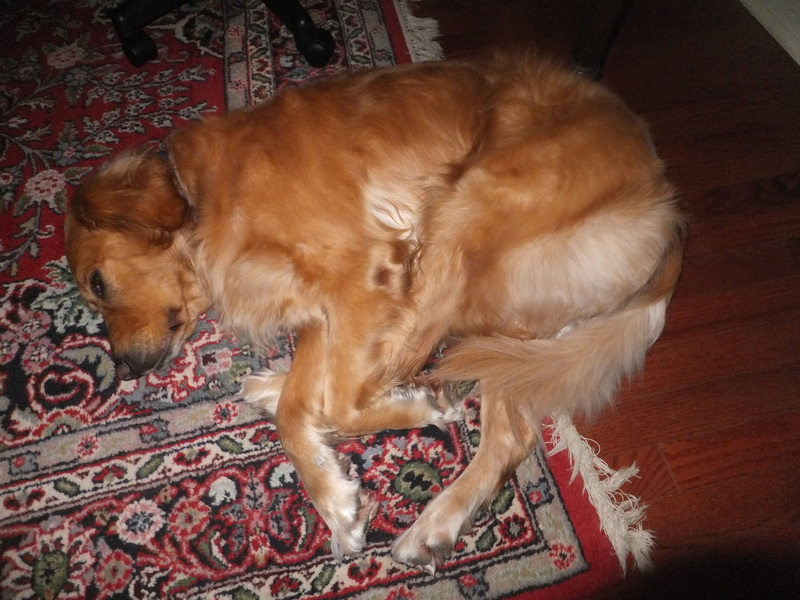 Okay, the Golden Retriever is allowed in the house, but only in certain rooms. 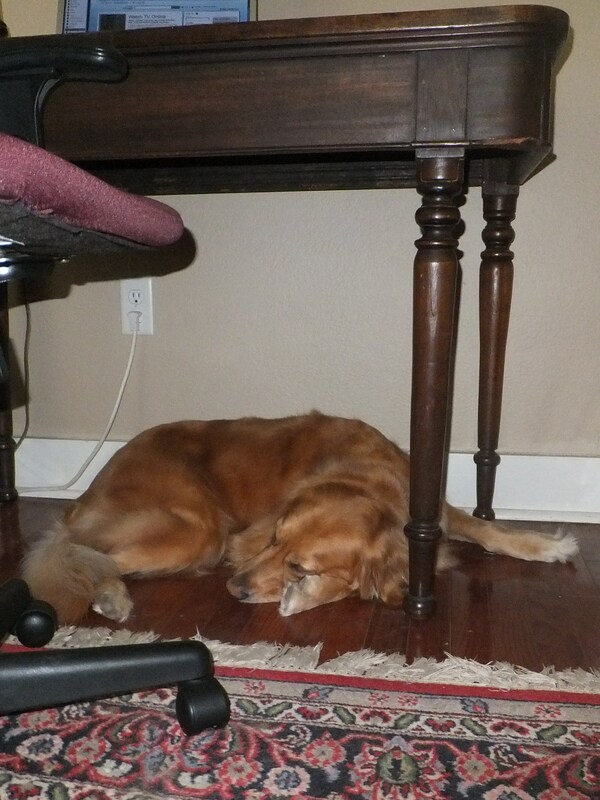 The Golden Retriever is allowed in all rooms, but has to stay off the furniture. 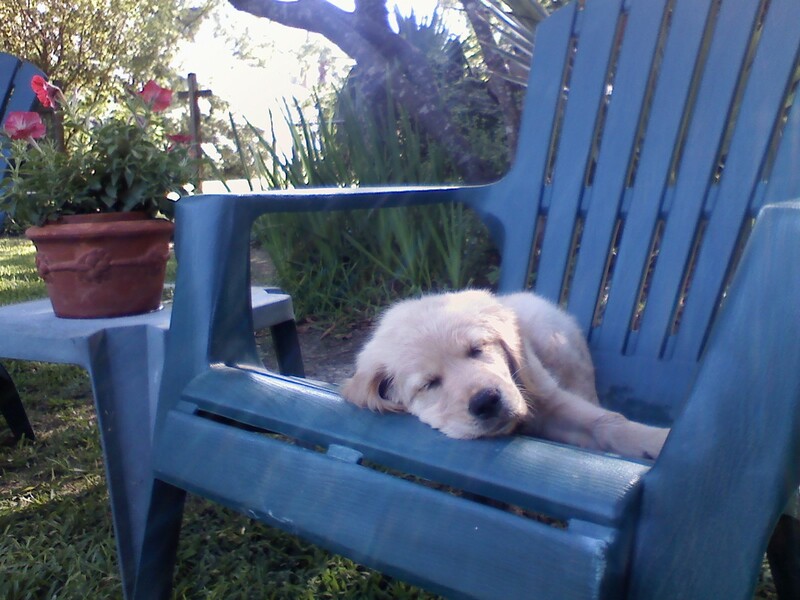 The Golden Retriever is only allowed on the old furniture. 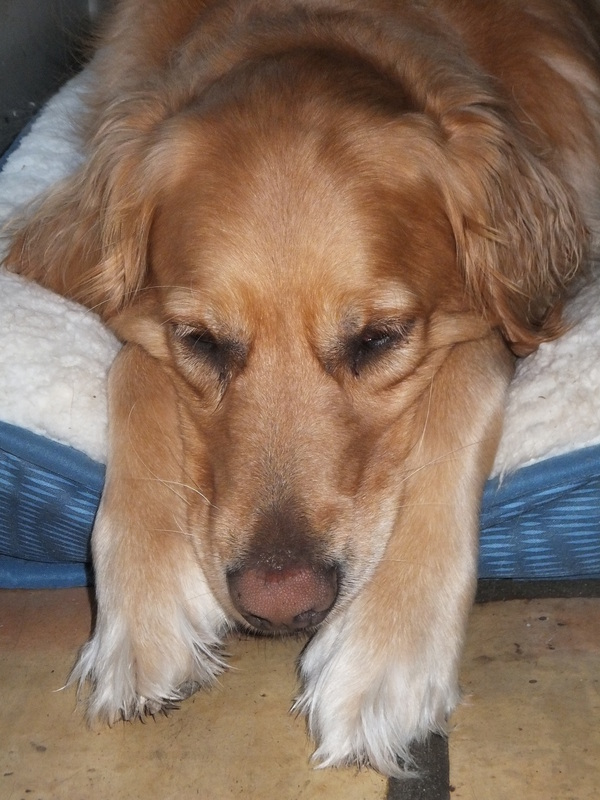 Fine, the Golden Retriever is allowed on all the furniture, but is not allowed to sleep with the humans on the bed. 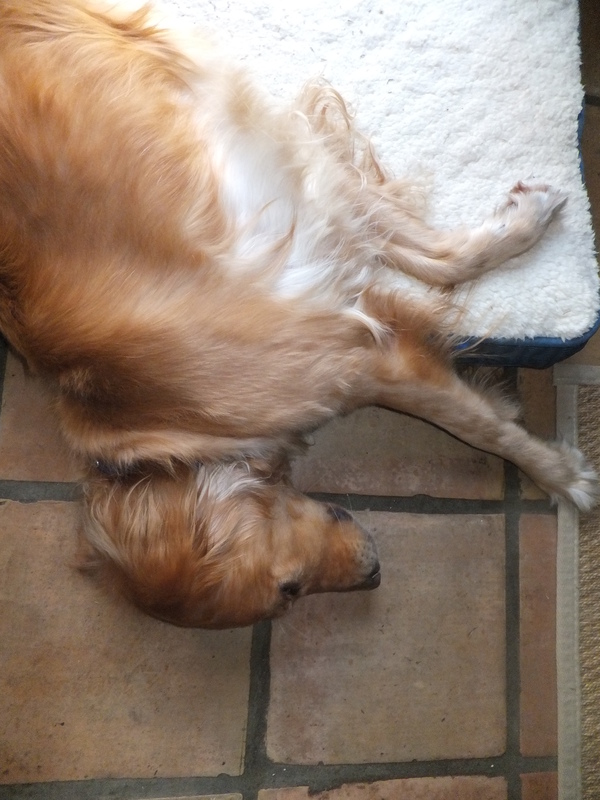 All right, the Golden Retriever is allowed on the bed, but only by invitation. 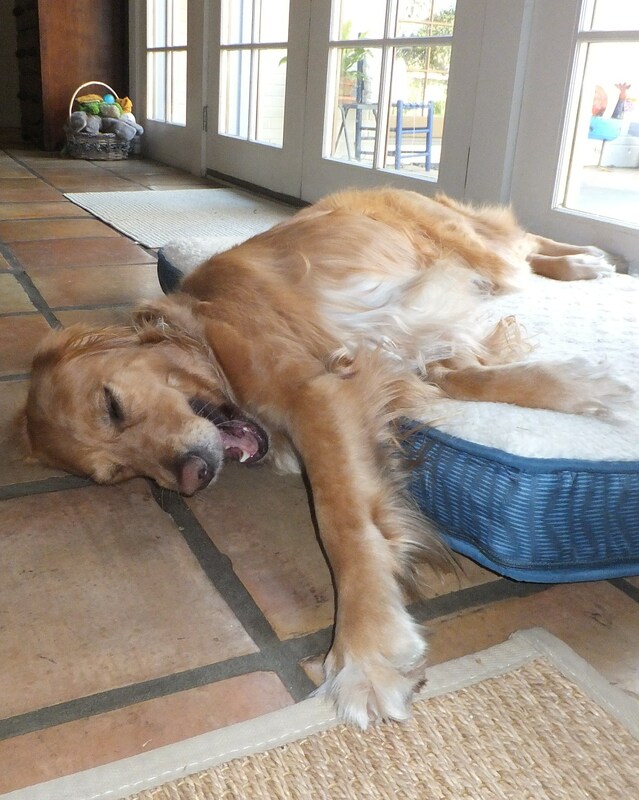 The Golden Retriever may sleep on the bed whenever he wants, but not under the covers. 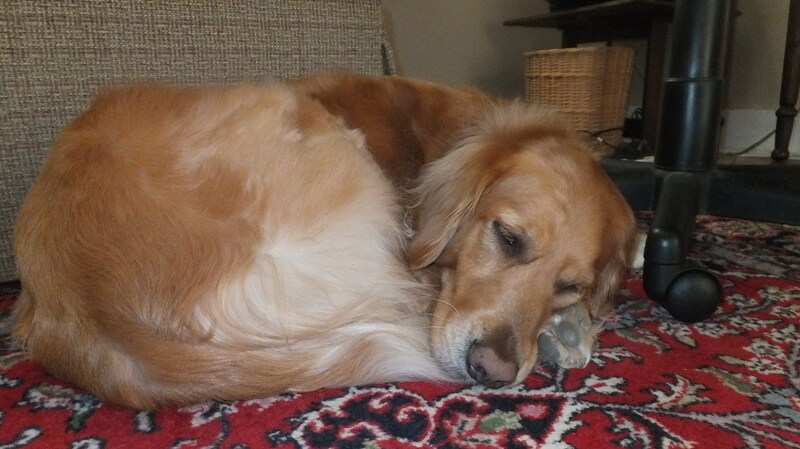 The Golden Retriever may sleep under the covers every night. Humans must ask permission to sleep under the covers with the Golden Retriever! In all cases of dispute . 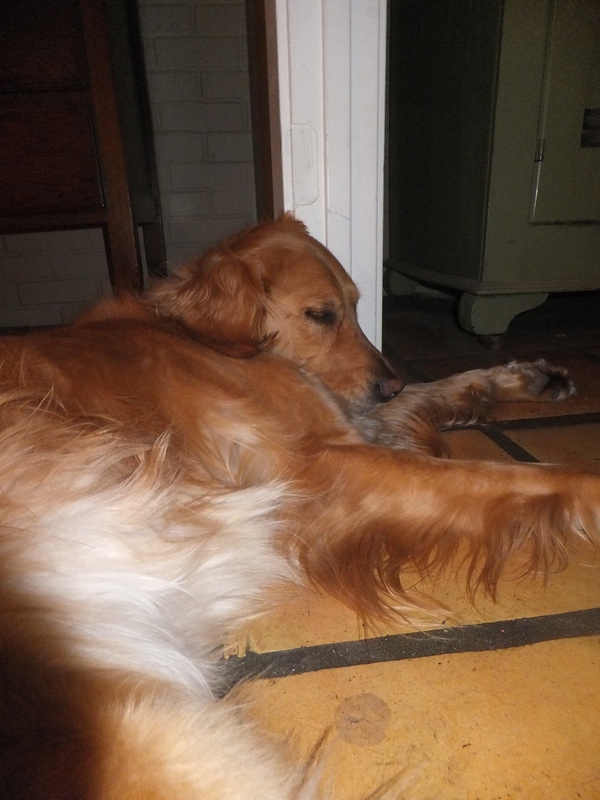 . . the Golden Retriever rules! I hope you’ll share this with your humans. It’s something they need to understand. It’s GameDay and I am ready for some football. 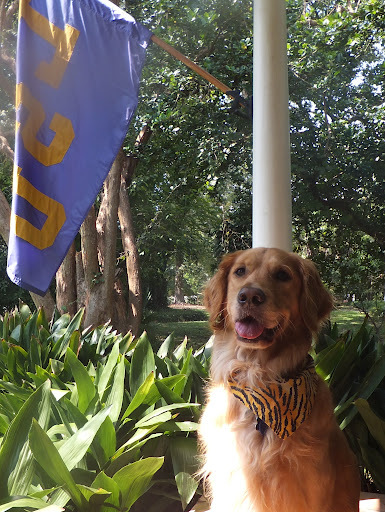 You may have noticed from my collar in the last post that I am an LSU fan. 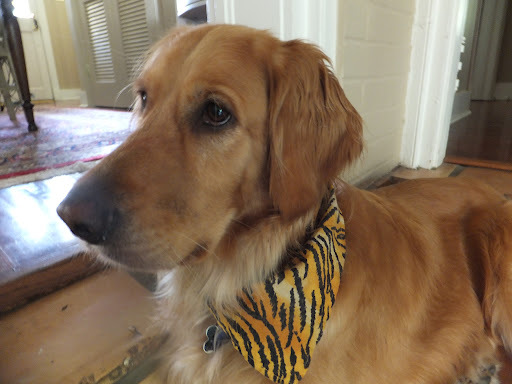 Today the Tigers open their SEC season against Auburn, so I have raised the flag and donned my finest tiger-print bandanna. Check out my profile. 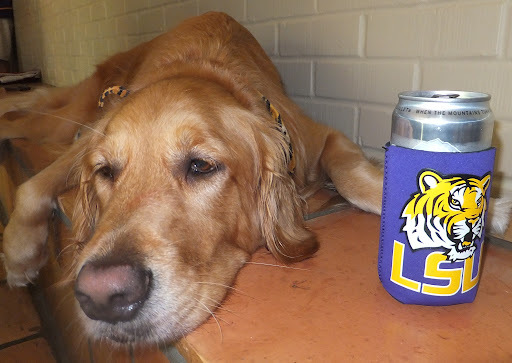 There’s a certain amount of preparation required from LSU Tiger fans, even for an away game. We have to select a lucky place to sit–or sometimes stand if the game gets too close. I’ll probably alternate between the rug in front of the television and one of my beds in the den. We have to decide what to eat for the game. I’ll probably have my usual dry food and maybe a rawhide treat. More importantly, we have to decide what to drink for the game. While I normally stick to water, GameDay calls for something special. 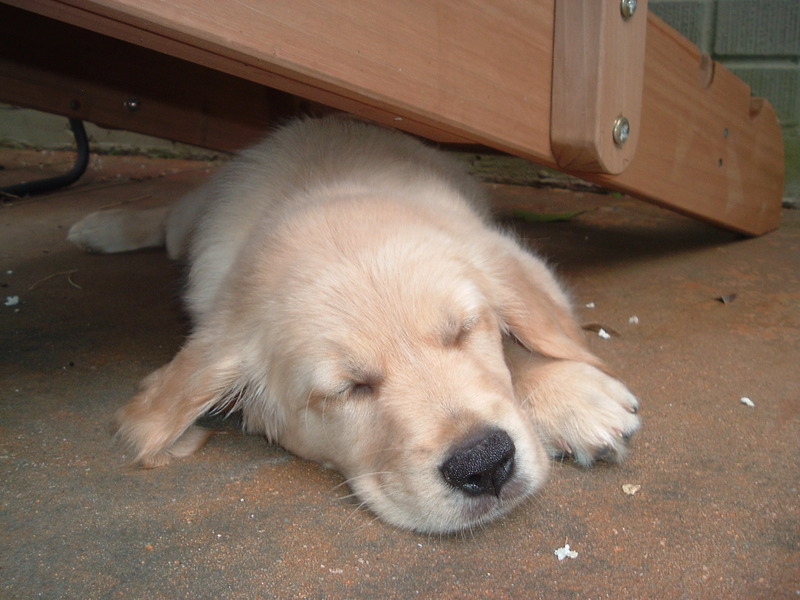 I know I look like I’ve had a little too much, but I’ll be ok. I’ve been doing GameDay since I was a puppy. 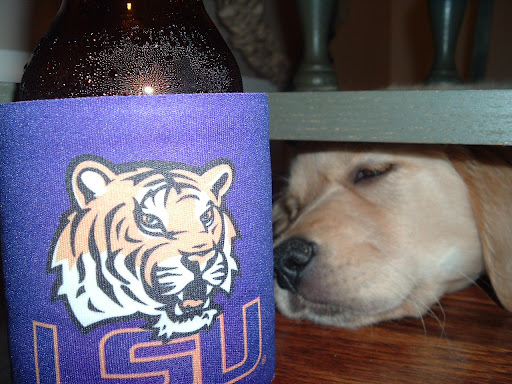 So here’s to my LSU Football Tigers. Have a great game and . . .